Effective early case assessment is dependent on a complete data set. On the average 97% of data generated within businesses is electronic. The average employee generates and receives up to 20 MB of email and potentially hundreds of MBs of office work files per day. Litigation is a huge problem these days for businesses. A huge amount of the cost of litigation is the cost of finding and reviewing electronically stored information (ESI) for both early case assessment as well as eDiscovery request response. ESI can hide anywhere in the corporate infrastructure; custodian workstations, network share drives, USB thumb drives, CD/DVDs, iPods etc. A centrally managed and fully indexed archive can speed the collection and review of potentially responsive records for early case assessment as well as more fully control and insure the placement of litigation holds. Provides an early indication of the merits of the case – do you have any actual liability. Can suggest the proper strategy going forward. Can provide you an estimate of the cost of defending the case and the time required. Will help you plan for the discovery process and prepare for the “meet and confer” meeting. Let’s look at some scenarios. You’re the General Counsel of a publicly traded software company in the state of California. It’s a Friday near the end of summer and you’re sitting in your office thinking about your Hawaiian golf vacation which begins tomorrow. You’re checking the last of your mail before you leave for 3 weeks. You immediately think to yourself; once this news gets out, your company’s stock will be hammered, your board of directors will want an update yesterday, your channel partners will want to be advised on their potential liability, sales that are in process will stop, your CEO will want to know if the case has merit…and your wife will want to know why you just cancelled the Hawaiian vacation she was looking forward to (she was staying home). What the…? Who, in their right mind would seriously consider something like this much less put it in writing? To complicate matters, the VP of IT calls back immediately to tell you that the company only keeps backup tapes of the email servers for 30 days and are then recycled. She also informs you that the company has a 90 day email retention policy meaning that employees must clear emails older than 90 days out of their mailbox or the company will do it automatically. Copies of those emails, if they exist, will only be available on the employee’s local workstations. You think to yourself; if that’s the case, how did the outside law firm get them? You send one of your staff attorneys and an IT person to both Bob and Jennifer’s offices to look for a copy of the email on their local computers etc. Later, you find that Bob has a 3 GB PST, local personal email archive, on his laptop where the email might exist but for some reason the IT guy can’t open it. IT calls Microsoft support and is told that the PST is too big and is no doubt irrevocably corrupted. In the mean time, one of your staff attorneys spends 4.5 hours at Jennifer’s office and eventually finds a copy of the email in her local PST… the email really does exist…%$#@!!. She has no idea why she would have written something like that and there are no records of any other emails associated with that particular smoking gun email. Because the email in question is older than the company’s oldest email server backup tapes, your early case assessment is stopped dead for lack of data. After several months of negotiating with ABC Systems and their law firm, you settle for damages of $35 million and an apology published in the business section of the San Jose Mercury News. In the preceding scenario, the available early case assessment process suggested that the case might have merit and should be settled before more resources were expended. In this case, the early case assessment was negatively impacted by a shortage of data due to retention policies that were put into place mainly for storage management reasons. Having access to all relevant information early on can mean the difference between fighting a winnable case and settling the case early for hopefully much less then is being asked for. An early case assessment strategy with the right tools can improve the odds of a favorable outcome. Let’s look at the preceding scenario with one difference… the defendant has an ESI archiving system and a more common sense retention policy which in this case includes a 3 year retention policy for email. This can’t be real. This must be a joke from your $*@$!! Brother-in-law. After calling him and determining it’s not a joke you think to yourself; NOW WHAT? Instruct one of your staff attorneys to query the email archive to determine if that specific email exists, and to provide the entire conversation thread around that email so you can review it for intent. You continue with your golf vacation having only missed two days and your wife is especially happy you were able to go on your vacation (alone). When litigation-based data management isn’t taken seriously dire consequences will occur. When it comes to electronic discovery, if you fail to protect potentially relevant data and it’s destroyed, no matter the excuse, you have deprived the other side of their right to all relevant evidence to support their case and subsequently put them at a disadvantage. What are your responsibilities when it comes to securing data that could be used against you in a current or future civil lawsuit? Judges today have little sympathy for accidental or shoddy data handling practices when it comes to protecting and turning over data in litigation. Controlling your company’s information at all times is crucial if, or when, you get dragged into civil litigation. What is eDiscovery? Well, it’s not an afterhours team-building exercise. Electronic discovery (also called eDiscovery or Discovery) refers to any process (in any country) in which electronic data is sought, located, secured, and searched with the intent of using it as evidence in a civil or criminal legal case. The eDiscovery process can be carried out offline on a particular computer or it can be accomplished on a corporate network. Since the new amendments to the Federal Rules of Civil Procedure (FRCP) were adopted in December 2006, judges expect that organizations in eDiscovery have complete control of their organization’s data and can fully respond to an eDiscovery request in days or weeks, not months or years. Does Exchange 2010 have eDiscovery Defensibility? One question I get asked a lot lately at webinars and seminars is; doesn’t Microsoft Exchange have all the tools I need to respond to a Discovery request? In other words can you rely on Exchange 2010 discovery capability for defensible search and litigation hold? Depending on who you talk to the answer can be yes or no. Now don’t get me wrong, Microsoft has made great strides on its eDiscovery capability over the last several years with Exchange 2007 and 2010. But there is at least one major question to ask yourself when considering if Exchange 2010 has the capabilities, by itself, to respond to a eDiscovery request. That question is; can I respond to a email discovery request quickly and completely enough to satisfy the opposing counsel and Judge in a defensible manner? One potential problem I’ve run across is a question of completeness of the eDiscovery search capability in Exchange 2010. Can you rely on it to produce the search results so that 1, all potentially responsive ESI can be found and placed on a litigation hold and 2, does the results set you eventually end up with contain all potentially responsive ESI? An obvious missing file type is the Adobe Acrobat .pdf extension. Many/most eDiscovery professionals will tell you that PDF files make up a sizable share of potentially responsive ESI in discovery. What if your IT department didn’t know about this limitation and never installed a separate iFilter for Adobe Acrobat files? What if your legal department didn’t know of this missing capability? Your discovery searches would not be returning responsive PDF files causing major risk in both litigation hold and your overall discovery response. Corporate attorneys in organizations using Exchange 2007 and 2010 as their email system should immediately ask their IT departments about their system’s ability to index and search PDF files. 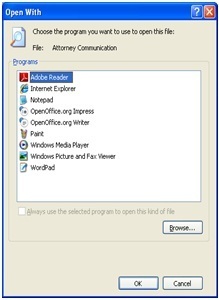 Attorneys on the other side of the table should be asking defense counsel the status of their Exchange 2007/2010 Adobe Acrobat search and litigation hold capability. In my blog “The coming collision of “free to the public cloud storage and eDiscovery” posted on June 23, I talked about these new free cloud storage options and how they could become a problem in the litigation/eDiscovery process. While researching that blog, I found an interesting capability with Microsoft Outlook and the various cloud storage offerings. It is called a email folder URL redirect. Microsoft Outlook includes the capability to associate an email folder with a Web page. You can set up this association so that when you select the email folder, the Web page appears or the contents of the folder appear. This capability can be useful when you want to include internal instructions or news about the organization. Another example would be a redirected folder pushed out to all in the organization announcing a litigation hold and answering questions about the hold, expectations, target content etc. Although this capability provides the opportunity to create powerful public folder applications, non-approved scripts can be included on the Web page that access the Outlook object model, which exposes users to security risks so users should not be adding redirected email folders without IT’s approval. So how does this capability, email folder URL redirection, relate to cloud storage? All four of the “free to the public cloud storage” offerings mentioned in the blog include a web page where files can be uploaded, viewed and downloaded. This means, for example, the Amazon Cloud Drive service could be a redirection target for an Outlook email folder. If you don’t already have a folder list showing in your Outlook front end, click on the View menu, then click Folder List. In the Folder List, right-click the folder that you want to associate with a Web page, and then click Properties on the shortcut menu. In the Property dialog box, click the Home Page tab. In the Address box, type the URL for the Amazon Cloud drive web page. Click to select the Show home page by default for this folder check box if you want the Web view active. Now, by clicking on the new email folder, you will see the Amazon Cloud drive sigh in webpage. Some things you can now do include being able to open files from within your Amazon Cloud Drive. Once opened, data can be copied and pasted to a new email you might be creating. Some things you can’t do directly include saving an email attachment directly to your cloud drive, dragging a file in your cloud to an email. For both these capabilities, an interim step is required. Namely coping files to your desktop first. If that’s the case, is this capability useful? That depends… If you utilize a “free to the public cloud storage” service then you may want a more direct capability to view content in your cloud from within Outlook. This is somewhat of a stretch but you never know. The main reason I’ve highlighted this capability is to illustrate how difficult the eDiscovery collection and litigation hold processes are getting when custodians have all these different options for storing (hiding) potentially responsive ESI. The discovery process is tough, time consuming and expensive. What new problems are corporate attorneys facing now with the availability of “free to the public cloud storage”? First, what is “free to the public cloud storage”? For the purposes of this blog I will define it as a minimum amount of storage capacity offered by a third party, stored and accessible via the internet made available to the public at no cost (with the hope you purchase more). The cloud storage offerings I’ve already mentioned do not limit the types of files you can upload to these services. Music storage is a prime target for these services but many, like myself, are using them for storage of other types of files such as work files which can be accessed and used with nothing more than a computer and internet connection, anywhere. Examples of these cloud storage offerings include Dropbox, Amazon Cloud Drive, Apple iCloud, and Microsoft SkyDrive. I looked at the Google Cloud Service but determined it is only useful with Google Docs. A more detailed comparison of these services can be found here. The advantage to users for these services is the ability to move and store work files that are immediately available to you from anywhere. This means you no longer have to copy files to a USB stick or worse, email work files as an attachment to your personal email account. The disadvantage of these services are corporate information can easily migrate away from the company security and be managed by a third party the company has no agreement with or understanding of in reference to the third party will respond to eDiscovery requests. Also be aware that ESI, even deleted ESI is not easily removed completely. In a previous blog I talked about the Dropbox “feature” of not completely removing ESI when deleted from the application as well as keeping a running audit log of all interactions of the account (all discoverable information). The Amazon Cloud Drive has the same “feature” with deletions. The big question in my mind is how will corporate counsel, employees and opposing counsel address this new potential target for responsive ESI? Take, for example, a company which doesn’t include public cloud storage as a potential litigation hold target, doesn’t ask employees about their use and or doesn’t search through these accounts for responsive ESI…potential spoliation. Be aware these types of possible ESI storage locations exist. Create a use policy addressing these services. Either forbid employees from setting up and using these services from any work location and equipment or if allowed be sure employees acknowledge these accounts can and will be subject to eDiscovery search. Audit the policy to insure it is being followed. Enforce the policy if employees are not following it. Understand that if you setup and use these services from employer locations, equipment and with company ESI, all ESI in that account could be subject to eDiscovery review. If you use these services for work, only use them with company ESI, not personal files. Be forthcoming with any legal questioning about the existence of these services you use. Do any of your employees utilize company sanctioned or non-sanctioned public cloud storage services? Do you have a use policy which addresses these services? Does the policy penalize employees for not following this use policy? Do you audit this use policy? Have you documented the above? These services are the obvious path for employees to utilize over the next couple of years to make their lives easier. All involved need to be aware of the eDiscovery implications. I ended my last blog with the question; So what and how should a company put in place a process to make sure this type of metadata is removed as a standard process before litigation arises? Before we answer that question, let’s review the point of the last posting. The point was that Microsoft Office (and other applications) can be a rich source of discoverable information (not just metadata, thanks Leonid) for the plaintiff, especially if the author of the document didn’t take the time to scrub all hidden and personal information before finalizing it. Obviously this unseen data can be a goldmine for the opposing counsel if they know to look for it. To address this risk, you should get your employees into the habit of “finalizing” documents by running the Microsoft Office “Document Inspector” as well as deleting all previous revisions of the document. To many, this seems like a lot of trouble but in the long run can significantly reduce your eDiscovery risk. The Document Inspector provides a central location for you to examine documents for personal, hidden, or sensitive information. You can then use built-in Document Inspector modules to remove unwanted information more easily. The document inspector can be found by clicking on the “Prepare” topic and then on the “Inspect Document” menu item. The Document Inspector is available the same way in all Microsoft Office applications. As you can see above, the Document Inspector allows you to check for Comments, revisions, versions, annotations, document properties, personal information, custom XML data, headers, footers, watermarks and hidden text. This type of data can be damaging in litigation if the discovered party is not aware of its existence. From this point, you can either “remove all” hidden data for each topic searched on or none of it. But that’s the point right? You can’t remove this data after a litigation hold has been applied so by removing this hidden data as part of a consistent process will remove the risk of having to review and turn over this data in discovery. The two points to remember is first, this hidden data and metadata could exist in you employee’s potential responsive files which means you better review it before you turn it over and second, there are ways for employees to easily remove it themselves as part of a documented process. There are some pretty nice freeware applications available which allow a user to encrypt and hide files/data/electronic records in plain sight on their computers. Can this pose a problem for IT and corporate legal? Let me put it this way…how would you find and place ESI that’s encrypted or is both encrypted and made to look like something else on a litigation hold? Does the fact that encryption applications present in a corporate infrastructure make claims of spoliation if the files can’t be found or decrypted more likely? Is this a problem you should even worry about? It’s a stretch but in some circumstances this capability could significantly raise your eDiscovery risk. To illustrate this problem further I will specifically talk about an application called TrueCrypt which is a free open-source disk encryption software application for Windows 7/Vista/XP, Mac OS X, and Linux. TrueCrypt is an application for creating and maintaining an on-the-fly-encrypted volume (data storage device as opposed to a single file).This means that you can create an encrypted volume capable of storing many encrypted files which to casual observers, looks like a single file. On-the-fly encryption means that data is automatically encrypted or decrypted right before is loaded or saved, without any user intervention. No data stored on an encrypted volume can be read (decrypted) without using the correct password or correct encryption keys. There are several encryption algorithms available in the application but the most secure is the AES 256-bit key algorithm, the same one used by the federal government in many instances. Files can be copied to and from a mounted TrueCrypt volume just like they are copied to/from any normal storage device (for example, by simple drag-and-drop operations). Files are automatically decrypted on-the-fly (in memory/RAM) while they are being read or copied from an encrypted TrueCrypt volume. Similarly, files that are being written or copied to the TrueCrypt volume are automatically being encrypted on-the-fly (right before they are written to the disk) in RAM. Now, to make matters worse (or better depending) TrueCrypt also can create a hidden encrypted volume within the visible encrypted volume. The principle is that a TrueCrypt volume is created within another TrueCrypt volume. 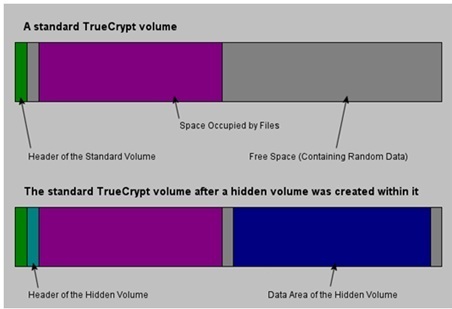 Even when the outer volume is mounted and visible, it would be impossible to prove there is a hidden volume within it or not, because free space on any TrueCrypt volume is always filled with random data when the volume is created and no part of the (dismounted) hidden volume can be distinguished from random data. Note that TrueCrypt does not modify the file system (information about free space, etc.) within the outer volume in any way. So to put it another way, an employee trying to hide data from a discovery search could first create an encrypted volume on their hard disk or some other removable device such as a USB stick and store encrypted data on it. Even more diabolical, they could move some innocuous data to it as a decoy and store the real data on the hidden volume inside the original volume. This capability provides the employee plausible deniability in the case of corporate legal or IT forces the employee to decryption the volume they can see. So the big question is this; how would you as a discovery auditor even know of or find these hidden and encrypted data volumes? In reality it’s not easy. You have to go into it looking for hidden and encrypted data. There are some forensics applications that will at least find and flag encrypted files and volumes including the TrueCrypt format. I am unable to determine if these forensics applications can find and flag hidden volumes. 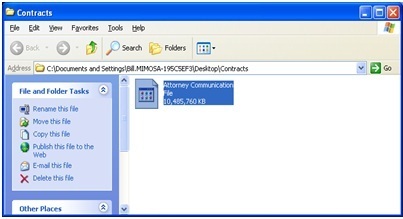 As a test, I setup a 10 GB TrueCrypt encrypted volume on this computer and named it “Attorney Communication” in a folder I named “contracts”. To the casual observer all they see is a large file in a folder called “contacts” (see below). Within that encrypted “Attorney Communication” file I copied four decoy files to make it look like those were the important files I was keeping encrypted just in case I am forced to open the encrypted volume by legal (see below). As you can see above, you can’t tell by looking at it that it contains the hidden 8 GB volume I had also created. That hidden volume is accessible only by typing a totally different password. So how do you find these hidden volumes and files if the employee is not cooperating? If you suspect the employee has been using this technology the first obvious step would be to do a search of the employee’s hard disk looking for an application called “TrueCrypt”. This would be a dead give-away that the employee could have encrypted and hidden data volumes on their computer. This is not certain because the employee could have installed the TrueCrypt application on a USB stick, which does not integrate with Windows, so when not plugged in to the computer, there would be no trace of the TrueCrypt application. That leaves the problem of discovering the hidden volume. A sure but very slow process to test this possibility would be to copy a bunch of files into the encrypted volume, if the employee has opened it, to see if the available storage space id equal to the volume size. For example the file properties in Windows states my encrypted volume is 10 GB in size but in this example the employee only has 5 MB of files stored in it. To test to see if the volume contains a hidden volume, you could copy an additional 9.95 GB of data into it to see if you get a “volume full” message before all of the data was copied into it. If you could only copy an additional say 1.95 GB before the “volume full” message was received, that would indicate that a hidden 8 GB volume exists. A faster way to get an indication of hidden volumes is to use a large file finder tool. I found one called “Largefiles3” which had a surprising capability. In this case I ran the application looking for files larger than 10 MB on the C drive. The interesting capability here is that it found the encrypted volume I named “Attorney Communication” but it determined its size to be 2.147 GB not the 10 GB shown in the Windows file system data. This is because I had created an 8 GB hidden volume inside the “Attorney Communication” volume thereby only leaving 2 GB for the original volume. This is a huge red flag if you are looking for it. Now, without the password you still can’t access the original encrypted volume or the hidden volume but at least you would know it exists and can apply pressure to the employee. So how do you prevent these encryption applications from putting your eDiscovery processes at risk? The most obvious one is to include in your employee computer use policy a statement prohibiting the use of these types of applications with stated punishments if not followed. This will stop general employees from using this kind of application but will not deter those employees bent on breaking your rules. The obvious next step is to sample and audit your employees to see if these applications are being used. For corporate legal, the main thing you want to establish is your “good faith intent” to make sure your eDiscovery processes are defensible.